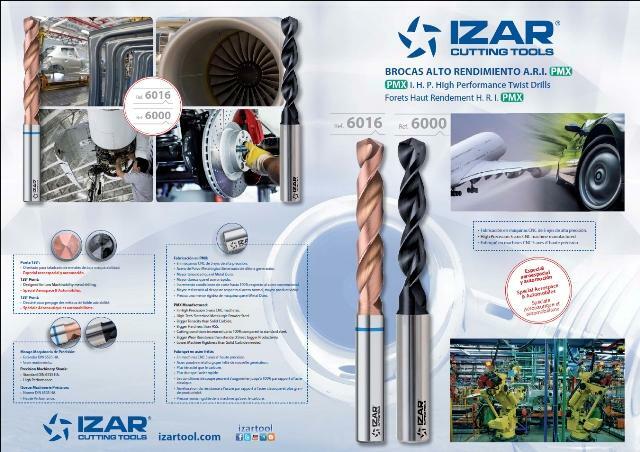 IZAR is the leading manufacturer of cutting tools and it has just brought out its new 2015 Industrial Catalogue onto the market. It is the most extensive of its one-hundred year-old history and contains many novelties for its more technical customers. Its two new PMX drill bits, ref. 6016 and 6000, form an important part of this IZAR catalogue, with its 416 pages, 500 references and 11,000 articles. These drill bits are the result of a European research and development project that has lasted for more than one year. Manufactured in high-precision, 5-axis CNC machines, these high performance tools have a tip angle of 138º, ideal for such demanding sectors as the aerospace or automobile ones. Thanks to the latest generation sintered metal powder they are manufactured with, which is tougher than hard metal, and also harder than high-speed steel, increases cutting conditions by up to 100% with respect to conventional steel, as it has better wear resistance, which has an impact on its productivity. Furthermore, it requires less machine rigidity than hard metal. Ref. 6016 for blue ring is especially designed for work on stainless (AISI 304) and hard materials, and it has a new copper-coloured coating of Nitride+Titanium+Aluminium+Silicon (TIALSIR), which maximises efficiency in very hard steels, cast iron, copper, bronze or hard plastic. Ref. 6000, coated with Titanium Aluminium Nitride (NITREX) and special for titanium (Ti6AI4V) and special alloys, such as Nimonic, Hastelloy, Inconel… has an “S” shaped helix, which achieves faster, more stable and more precise drilling. It has a Convex type corrected edge, which improves the machining surface finish, making it highly suitable for working materials with poor thermal conductivity.